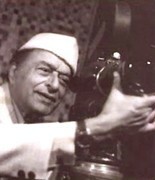 A schoolarship sponsored by V.Shantaram Motion Picture Scientific Research and Cultural Foundation has been in place for students doing research on films in the Department of Communication and Journalism, University of Mumbai. Under this scholarship scheme students studying in the Department of Communication are eligible to apply. Students applying the scholarship will have to research on different faculties of Dr. Shantaram has wroked in the various departments of Film. Should you require information regarding the same, kindly contact the DCJ oofice.